Can you see the light?!? Last weeks/months I did spend a lot of time impressioning locks. I try to open at least one lock per day with this tecnique. And most of the time I succeed in that, and it is giving me quite a confident feeling. But when I tried to open a relatively simple abus 5 pin cylinder that was mounted in a door, on a rainy day in the middle of the night, this confidence was nowhere to be found. Before you ask ‘why was Barry in the middle of the night trying to open a lock?’ … it was because the owner lost his key. To make a long story short, trying to open that lock became a disaster. And there is no one to blame but myself, except maybe the bad lighting conditions on the scene. I just could not see the marks. So I went search for better light sources that could be used for impressioning ‘in the field’. 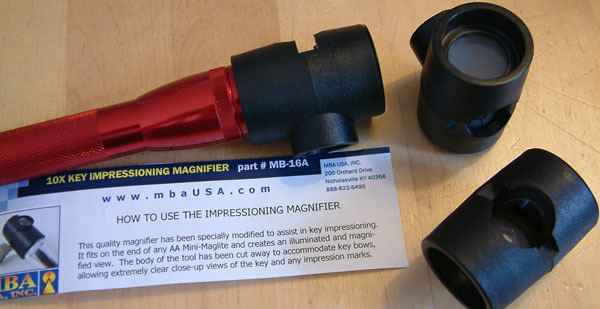 A few weeks before the disastrous Abus adventure, someone pointed me out that a company called MBA (in the US) sold a special impressioning magnifier. At first I did not think much of it. After all, how good a tool can it be for just $29 US? And using the Velleman loupe on my desk I never had a real reason to look for better light and view anyway. But now I needed something portable and started my search for the perfect ‘in the field’ impressioning aid. I tried out lots of lights and magnifiers. But not one could come close to the superb Velleman magnifier with it’s build in TL tube. The problem with all other light sources is that when you shine focused light on a blank you get blinded by the reflections. And all magnifiers with build in light I tested had some sort of focused spotbeam that was way too intense. At around the same time Oli pointed out an aid used for examining gems. It is a simple detachable unit that fits a maglite flashlight. And inside is a filter to diffuse the light and a prism to create a nice indirect effect when looking at the object. The interesting thing is it showed great similarities to the MBA unit I ordered. I guess there are the same, especially when I finally received them in the mail and could take a close look. I suspect MBA did modify the unit a bit to make it better suitable for examining long metal objects. I must say I like the tool a lot. Light on the blank is the best I have seen so far for a portable unit. And the magnification of 10X is also very helpful. Still there are some minor disadvantages. One of them is the short range where the blank is ‘in focus’ when looking trough the magnifier. It seems to require some skill to keep the blank at the right distance. But maybe this will change if you practise some with it. Another small disadvantage is that when you see marks on the blank they disappear from the naked eye when you remove the blank from the tool. This leaves you with the question where on the blanks the marks are you could see so clearly under the light. Adding some marks on the side of the blank (using a marker or make some scratch marks) will solve that problem. You only have to count at around what mark on the side of the blank you have to start filing. Before I will attempt to open doors in the field again I will make very sure to be fully confident with this tool. And even tough I like this tool, the search for the ideal light is still on …. This entry was posted on Wednesday, June 6th, 2007 at 13:22 and is filed under Uncategorized. You can follow any responses to this entry through the RSS 2.0 feed. You can leave a response, or trackback from your own site. i think i’ll order http://www.velleman.be/es/en/product/view/?id=370266 (2.25 magnification). But a mobile unit sure sounds nice. By the way: Has anybody ideas about how to make an acceptable “do-it-yourself” endoscope for short range examination of locks? I mean, something that one could use to look into complicated warded locks, or lever locks? Maybe modifying an otoscope with a small mirror to see at 90 degrees ? I want one! Any chance you’ll order some more of the MBA magnifiers? for money and for a portable unit the best I have seen so far. Jarren: I am afraid you will have to find someone else to get them for you. Berend I know personally (as he won the Dutch Open 2006), but unfortunately I can not make the offer to people I don’t or hardly know. Maybe it’s time for a Toool webshop? seems like a good idea. now what about if you were to add a bracket or a jewelers clamp to put the key in the right spot of where the depth of field is. this would help keep it in focus and also keep it more steady when examining it. ive done alot of macro photography stuff, and thought i would put in my 2 cents. kspec: Great idea to add clamp(s). But for the moment I don’t need a clamp as I am starting to develop a feeling for it and don’t need much time to get the key in focus. And today someone visited me to collect one of the magnifiers. He brought a new version of the MagLite that works with a LED instead of a lightbulb. This even give a more clear image then before …. Entries (RSS) and Comments (RSS). 61 queries. 0.556 seconds.